Recently I spent a few days exploring Naples. Sometimes this meant getting up before dawn so that I could be out on the streets before sunrise, those were the hours, or rather minutes, during which these photographs were taken. 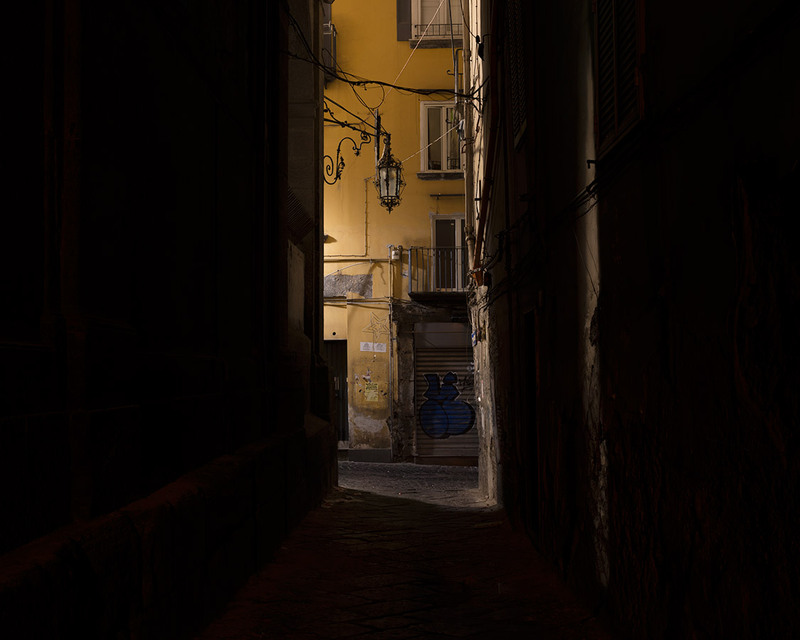 The street lighting starts going off ‘at dawn’ like it would in any city as it is starting to get light then, but in the old town where the streets are tall and narrow this is not the case as what little daylight there is does not penetrate. This meant that for a short while the streets were dark, really dark. The only illumination came indirectly from doorways and windows, long stretches were pitch black. Technically ‘unsafe’ but actually not a problem to walk along the streets were very beautiful, what is lost in light level and uniformity is gained in atmosphere. Living in London where it is not possible to find conditions like this it was a rare treat to experience darkness in a city, it was only a few brief moments but it is one of many things I love about being in Naples.